Welcome to the Heart of the Matter Online meme: Father's Day Edition. By the way, what exactly is a "meme"? Anyone care to explain this concept and its origin to us men? Anyway, today's theme is similar to the uber-popular Wordless Wednesday. We want to see your favorite picture of your husband and your kids, or your husband and yourself, or just your husband alone. This picture always makes me smile! :-) It was taken in 2005 when Dozer wasn't even big enough to walk yet. My sister Lele got the boys these hilariously FUN t-shirts in New York City. David and I laughed at the boys all day long! The drawn in tie, sunglasses, cheesy pockets... man, it totally looked like the real thing! 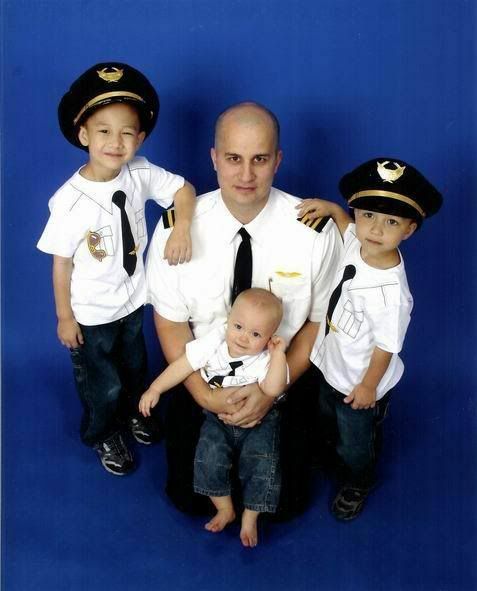 So far, they all still say they want to be a pilot like daddy. That's good and bad. The bad part is the very scary learning to fly stage... I am positive that I will go completely white-haired and ulcered during that time! So I'm just not going to think about that right now... or ever. If I don't talk to y'all again, have a wonderfully happy Father's Day weekend! And for you single momma's out there, Happy Father's Day to you too! If you are pulling double duty, you deserve a big pat on the back, high five and a Mint Mocha Chip Frappuccino too!